Although Pierre Gasly considers Daniil Kvyat a friend, he won’t be calling to offer commiserations over his lost Toro Rosso drive as that would make it “more painful” for him. 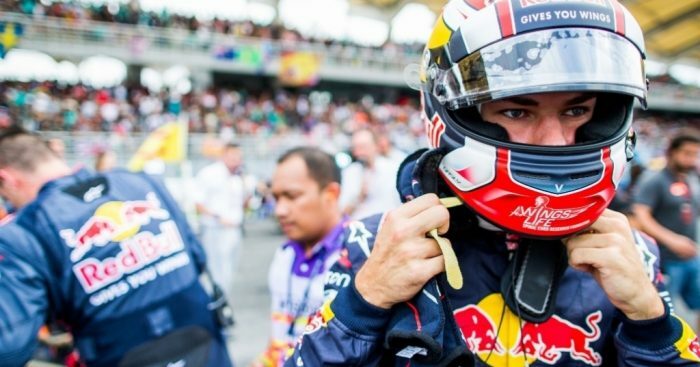 Gasly raced for Toro Rosso at the Malaysian Grand Prix, finishing P14 on his debut, and he’ll be back in the car at this weekend’s Japanese race. The 21-year-old’s opportunity to impress has come at the expense of Kvyat, who has been sidelined for at least two races. But while some reports suggest this could be a done deal – Gasly in, Kvyat out – others claim the Russian driver will be back from the United States GP onwards. Either way don’t expect Gasly to be calling Kvyat any time soon to offer commiserations. “You need to put yourself in his position,” Gasly told Crash.net. “I think it’s quite difficult and tough for him at the moment so I’m not sure it would be the best thing to send him a message. “I’m just trying to focus on my job, it’s going to be my future. “I want my future to be in this paddock so the only thing I can do is focus and put all my energy on this aspect. “And I don’t think there is anything positive from my side for him. “I will talk together, if he wants to speak then I’ll be open you know, he is a friend and it’s going well for me whereas it is quite a tough situation for him.